Students in Professor Mez Baker-Medard’s Fall 2014 ENVS 401 senior seminar focused on lead poisoning prevention worked with the Vermont Department of Health, the Association of Africans Living In Vermont, the Vermont State Refugee Coordinator, the Burlington Lead Program, and the Vermont Housing and Conservation Board to both map soil lead data in the Burlington area (part of a larger database of statewide soil lead data students compiled) and to develop culturally appropriate and translated materials on lead poisoning prevention for the refugee populations in the Burlington area. The translated materials took the form of a suite of videos and a lead resources guide translated into French, Nepali, Arabic and Swahili. 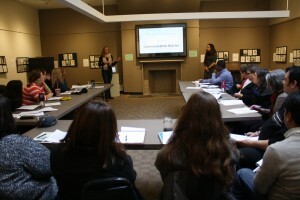 Students presented at the statewide Refugee and Immigrant Service Provider’s Network meeting on December 11, 2014 to both detail their process and encourage the dissemination and utilization of their final products. Their work was quite well received! The videos and resource guides were recommended as a tool for one of the health topics covered by instructors who train refugees who wish to open a child care provider business and was also shared with the federal Office of Refugee Resettlement and the network of State Refuge Coordinators around the country. The soils data were shared with the Senior Planner with the Chittenden County Regional Planning Commission to complement their latest EPA funding application for brownfields remediation and the Sustainability Coordinator for the City of Burlington.